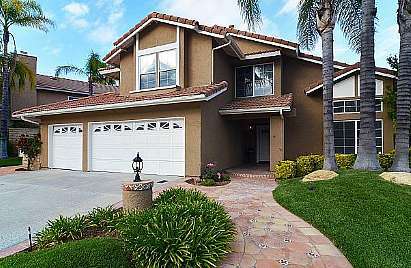 Super sharp Saugus pool home with loads of upgrades! 4 bedrooms plus large den with fireplace (possible 5th bedroom), full bed & bath downstairs, formal living room, separate dining, remodeled kitchen, dining nook, family room, and laundry room. Upgrades abound and include 20" tile and plush carpet throughout, wrought iron staircase, re-finished cabinetry throughout, crown moulding, new baseboards and door/window casing, and much more. New gas fireplace with custom mantle, stainless appliances in kitchen, granite counters, stone backsplash, cast iron sink. Master bath features new tub and separate stall shower with custom tile. Ceiling fans and new window coverings in all bedrooms, new door hardware, and much more! Awesome private backyard has a large pool with waterfall feature and nice grass area. Large mature palm trees, 3 car garage, bonus storage over garage, the list goes on! Come and see for yourself.